Wilkie Collins’s spellbinding tale of romance, theft, and murder inspired a hugely popular genre–the detective mystery. Hinging on the theft of an enormous diamond originally stolen from an Indian shrine, this riveting novel features the innovative Sergeant Cuff, the hilarious house steward Gabriel Betteredge, a lovesick housemaid, and a mysterious band of Indian jugglers. I choose this for my Gothic novel category in the 2017 Back to the Classics challenge. It's a super-duper page turner which has been said to be the first ever detective story. It's fast moving with changing narrators, and the spooky gem at the centre of the plot comes across creepier than any character could possibly be. Rachel Verinder is given a priceless Indian diamond on her 18th birthday, but it vanishes from her cabinet overnight. Everyone assumes a trio of loitering Indians must have broken in, until police prove that the theft was surely an inside job. Yet the only people who spent the night under the roof, apart from Rachel, her mother and the servants, were two male cousins. And Rachel is acting very odd, as if something constrains her not to reveal as much about the loss as she knows. 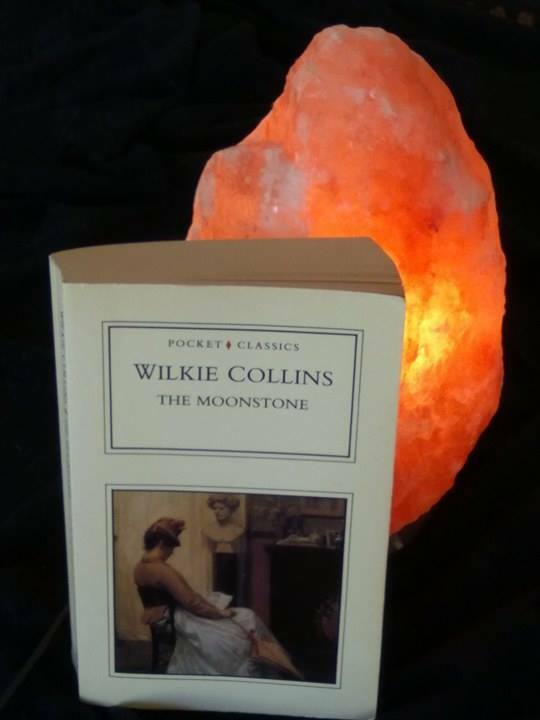 The moonstone itself totally deserves its title honour. Inanimate objects that supposedly have the power to influence human affairs are such stuff as Gothic tales are made of. It's a lavish but very sinister stone which is rumoured to bring evil luck to its possessor. Some people believe the wicked old uncle had a shady ulterior motive in willing it to his niece. Neither the thief nor the reader knows what they're getting themselves in for. 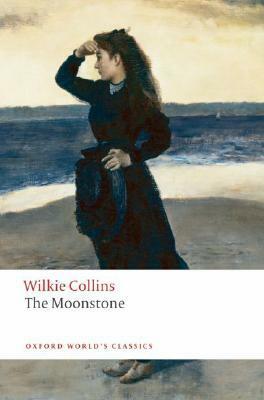 Wilkie Collins keeps us wondering whether the atmosphere of heaviness is caused by the gem itself, or by the depravity it draws out of characters' secret hearts. The characters are all fascinating, multi-faceted, and not always what they seem. I really want to do them justice, yet not at the expense of giving too much away. I'll just give a brief overview, as everyone should be regarded as suspects at the outset (or not, as the case may be). Rachel herself. Everyone who knows her best can vouch for her unimpeachable character and generosity. Yet they agree she's a girl who's secret, self-willed, odd and wild. The Servants. To mention the longest and shortest serving, Gabriel Betteredge is the lovable old head of staff who has served the family for decades. He has a quirky habit of using the novel 'Robinson Crusoe' as if it's his Bible or oracle. And poor Rosanna Spearman is a hunchbacked former thief, who's been given the chance to start anew. It seems her past history makes her a prime suspect, but is that worry all she has on her mind? The cousins. It's the era when cousins used to marry each other, and both young man have designs on Rachel. Godfrey Ablewhite is a beloved humanitarian who focuses on ladies' charities. He's a sweet-tempered, nice guy. Franklin Blake is more of a black sheep. He's been educated overseas and has a way of letting money trickle through his fingers. He's more the irresponsible, witty brand of nice guy who could never live up to Godfrey. Yet at least two women are madly in love with him. The Professionals. There's Sergeant Cuff the renowned detective, who's looking forward to retirement so he can devote his time to growing roses. And Mr Candy, the tubby little doctor who loves jokes but tends to be a bit tactless. He has a mysterious assistant, Ezra Jennings, who turns people off by his odd appearance. And then there's Mr Bruff, the loyal and sensible family lawyer. He becomes a barometer for the story's dramatic quality. If Mr Bruff can be astounded and amazed, surely any reader can be. The solution had me riveted, especially the painstaking and dramatic way it was proven. I have to hold my tongue here, but if you've read the book, I'd love to know what you thought of it. Seriously, you can send me a private message. I wouldn't have predicted the truth in my wildest dreams, yet the story has a thick trail of clues that all slot into place when we look back in hindsight. Absolutely mind blowing in my opinion. I don't want to stop rambling on about this story yet, so I'll mention a few little observations about life in the Victorian era. 1) The dangers of smoking were not known. Rachel convinced her cousin Franklin to quit cigars cold turkey not because she was concerned for his health but because she was tired of the odour in his clothes. And smoking was such a popular social pastime that a good host would offer each of his guests a fresh pipe. 2) The addictive quality of common household medicine was unknown. Instead of popping a Paracetemol or Ibuprofen for a headache or cramp, they'd take a few drops of opium, with no idea they might become hooked. 3) Religious zealots were pretty much the same. Miss Clack, the fanatical evangelistic relative, was obviously meant to be a bit of a caricature, but I've come across some modern Miss Clacks. She keeps trying to palm off religious tracts with titles such as 'Satan in your hairbrush.' I've been at the end of similar fervour from well-meaning folk! Like the lady who got concerned at the sight of my kids' toys and tried to convince me to read a book called, 'Turmoil in the Toybox.' The type who hunt for demons and heresies behind every bush are still alive and well. 4) Although the English thought they ruled the roost, strict adherers to the Hindu faith and its superstitions are not to be trifled with. Those who tried regretted it. When you get to the end, you can take the example of the thief. Because I still don't want to stop talking, I'll finish off with a few quotes. I'd love to have you join the Victorian challenge! I was intrigued when I saw it on your blog, so I think I might do that 😊 Especially if you think late April is still early enough to sign up. I've read quite a few Victorian books already.